(AP Photo/Andrew Medichini) Pope Francis, left, and Sheikh Ahmed el-Tayeb, the grand imam of Egypt's Al-Azhar, exchange a joint statement on "human fraternity" after an interfaith meeting at the Founder's Memorial in Abu Dhabi, United Arab Emirates, Monday, Feb. 4, 2019. Pope Francis has asserted in the first-ever papal visit to the Arabian Peninsula that religious leaders have a duty to reject all war and commit themselves to dialogue. 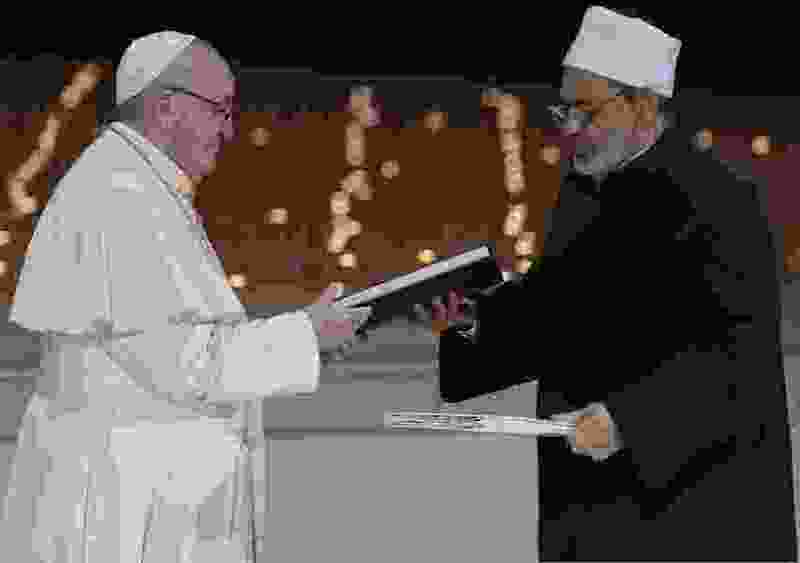 Abu Dhabi, United Arab Emirates • Pope Francis urged religious leaders Monday to work together to reject the “miserable crudeness” of war as he opened the first-ever papal visit to the Arabian Peninsula, the birthplace of Islam, with a strong denunciation of violence committed in God’s name. Francis also noted that while foreign laborers have helped turn the Emirates from a desert trading backwater into a global financial power, they are not necessarily made to feel welcome or become citizens. Human rights groups have long denounced violations of basic human rights and labor standards among the Emirates’ foreign workforce. Jon Gambrell reported from Dubai, United Arab Emirates. Aya Batrawy and Malak Harb contributed.